One of the top questions I get from readers is how to control their kid’s screen time. Now that kids have access not only to computers but also smartphones, tablets and other devices it is even more challenging to set up a system to help them be safe and limit the time they spend using devices. I have explained in many of my posts that I believe helping your kids control their screen time and understanding internet safety starts with age appropriate and regular family communication on those topics. Jodi Gold MD is a child and adolescent psychiatrist that has a unique perspective, especially when it comes to family communication! 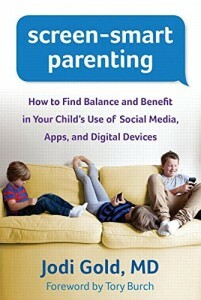 When I found out that she just wrote a book called SCREEN-SMART PARENTING: Screen-Smart Parenting: How to Find Balance and Benefit in Your Child’s Use of Social Media, Apps, and Digital Devices (Guilford Press, November 1, 2014, paperback) that had research and practical strategies, I wanted to find out more. 1. What motivated you to write SCREEN-SMART PARENTING? Jodi Gold, MD: “I am a child and adolescent psychiatrist. Every day, I went to work and listened to my patients. A theme began to emerge. This one got dumped on text and that one was playing too much World of Warcraft. Parents were worried that their kids were distracted during homework and increasingly concerned about how their children presented themselves online. Then I went to pick up my younger children (aged 5, 7, 9) at school and this mom was concerned about too much TV and that one was upset that her 4 year old could navigate an iPhone. I realized that if I listened carefully, I couldn’t make it through the day professionally or personally without confronting the realities of our changing digital landscape. I wasn’t startled that technology was ubiquitous or that current parents are the last generation of digital immigrants. I was surprised at the fear and ignorance. Parents, teachers and families were constantly fearful and distrustful. I went looking for answers on how to embrace technology and use it for good, but found little guidance. 2. Tell us about how you brought your background in as a doctor to helping explain these issues? Jodi Gold, MD: “Both the Academy of Pediatrics and the Academy of Child & Adolescent Psychiatry have begun to weigh in on parenting in the digital age. It is critical that physicians make this a priority for research and policy. I believe that we should be adding “digital milestones” to our list of developmental milestones and challenges. I hope that Screen Smart Parenting will deepen the dialogue on raising digital citizens in both the medical and parental world. 3. What is screen smart parenting and what areas does your book discuss? Jodi Gold, MD: “Screen Smart Parents are parents who are thoughtful and communicative about managing digital technology. They want to cultivate online resilience which scientists increasingly feel is linked to happiness and success in life. They want to instill in their children the tenets of digital citizenship. Eventually, screen smart parents will have the experience of being digital natives and citizens. Right now, most of us are digital immigrants with newly stamped passports and limited command of the digital language. Screen Smart parents do not need a Ph.D. in computer science but they need to check their fear and be willing to learn from and with their children. 4. What’s the right age for a phone/smartphone/social media access? Jodi Gold, MD: “This is a personal family decision but I can give you some guidelines as a mother, physician and expert in this field. Your child will eventually own a smartphone so the question is not “if” but when. You should give your child a phone when he/she truly “needs” one. Most kids get their phones and smartphones between the ages of 11 and 14 years of age. Here is a list of reasons for why you might choose to give your child a phone prior to the age of 11. It is likely that this decision will be somewhat driven by community/peer pressure. It is important for parents to be thoughtful about when and how they introduce a phone. A phone should be introduced in a developmental way (especially if you are giving a child a phone at a younger age).